curious to see the well the more expensive brands would fare out. 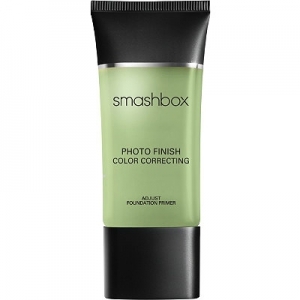 So I went to Sephora and cringingly purchased Smashbox Photo Finish Primer in Green at nearly $40. Up to date, this is the most I have ever spent on one cosmetic product. redness. I applied it to certain blotches of redness, blend the product in, and that area toned down in redness to blend in the rest of my normal complexion. I felt like I was photo-shopping my face with this green primer. And if felt like I had nothing on! The coverage and cover-up was very satisfactory… I felt so tempted to try on other area of my body (didn’t though). joy for me to get. My skin reacts by developing these hard, large-radius bumps – it looks like my skin is reacting to an insect bite. I get them regardless of which product I use, but what matters to me is the frequency at which I get them. With this green primer, the frequency was noticeably less. I still got the bumps but the performance of the green primer was so satisfactory, it didn’t discourage me at all from using it. If I’m going out, there is no way I’m leaving the house without this cover-up. for about a couple of weeks and I’ve already become reliant on this product. It makes my skin look next to flawless and it gives me a boost of confidence. Yes, I get the occasional bumps but I get them regardless of any product and it’s definitely worth it. However, this product is expensive, about $40, so I suggest using it frugally if your budget’s tight. I checked on the internet so if I can get it cheaper and discovered that you get it on ebay for less; I’ll probably try purchasing it there. For anyone with skin problems, I would definitely recommend this product.